Electrical utilities have networks used to transmit and distribute electrical power over a large geographic area. In their served areas will be power generating stations, alternative energy sources (solar, wind, geotherman, etc. 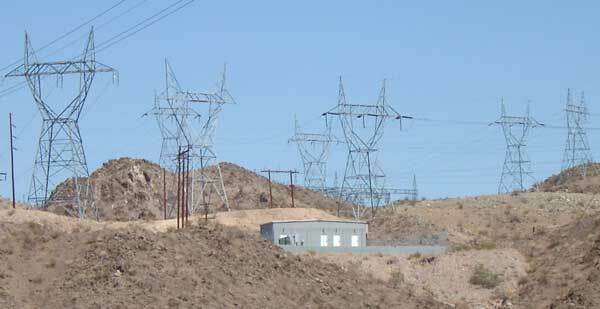 ), substations for distribution and microgrids. These networks must be monitored and managed to ensure reliable power for the utility's customers. For monitoring and managing networks, they use a variety of means of communications, including running fiber optic cables along the transmission and distribution towers, radio links and contracting landline and cellular communications services from telecom carriers. Utilities build fiber optic networks in similar ways that others build them, aerial and underground, but they also mix aerial cables in their power distribution cables, sharing towers and poles. In order to do this, they use some very different types of cables. Besides the use of special cables on transmission and distribution towers or poles, the installation of fiber optic cables for utilities may require the shutdown of electrical distribution for installation, although some installations are possible without shutdown. Electrical utilities have several cables available for their use on transmission towers and poles. Besides traditional cables lashed to messengers, figure-8 cables or ADSS cables, utilities can construct transmission links using optical ground wire (OPGW) or optical power phase conductor (OPPC), cables which include both fiber and metallic conductors, or optical power attached cable (OPAC) which is wrapped around power or ground conductors. The application of these cables is shown on the drawing below. They are not new technologies, having been developed in the 1980s and used all around the world. Another type of aerial fiber optic cable combines electrical distribution cables with optical fibers inside the conductors. There are two types of these cables, OPGW (optical power ground wire) and OPPC (Optical power phase conductor) cables. 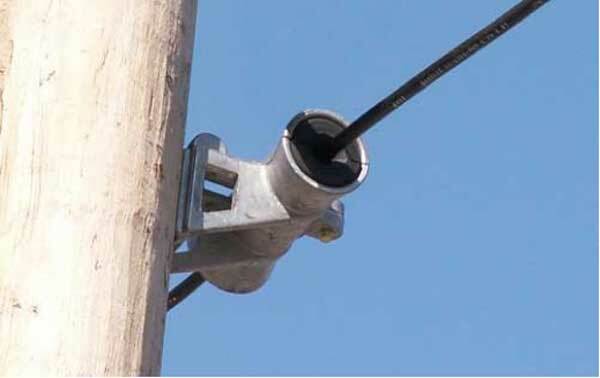 These cables are installed on poles or towers at the same position as regular conducting cables. OPGW and OPPC cables are not a new concept. The first patents on such cables dates to 1977 and they have been in regular use since the mid-1980s. The optical fibers are usually in the middle of the cable in a sealed metal tube and are surrounded by steel strength members and aluminum conductors. Since the fibers are glass and immune to electrical interference, the fiber is not affected by the electrical power being transmitted nor does it disturb the functions of the conductors. These cables generally use singlemode fibers for long links. Splicing is required periodically, of course, and that is generally done on the ground and splices protected in enclosures attached to the towers or inside the buildings required for the communications equipment. Installation or repair of OPGW or OPPC should be left to experienced utility personnel except for splicing which may be done by fiber installation personnel on the ground, supervised by utility personnel. OPAC (optical power attached cable) is a type of fiber optic cable that is installed by attaching to a host conductor along overhead power lines. OPAC cables can be installed on existing ground wires or phase conductors, even OPGW or OPCC to expand communications capacity. OPAC cables have been installed on spans of over 2km and tower heights over 200m. The attachment method is generally wrapping the cable around the power cable using special installation equipment called a "tug", but some manufacturers claim lashing or clipping the fiber optic cable to the power conductor is possible. This cable installation by wrapping is often known as "Sky-Wrap," a trade name of AFL, one of the suppliers. Like OPGW, OPAC has been used since the 1980s and is available from several suppliers. OPAC cables are all dielectric, small and lightweight to allow wrapping around conductors without adding too much weight or bulk. Due to the size limitation, OPAC cables have smaller fiber counts but in some cases two cables can be installed on one conductor. OPAC cables have been installed on spans of >2km and over 200m height. Cable jackets are designed to withstand abrasion caused by slippage on the conducting cable, temperature extremes and outdoor weather including ice buildup. Due to the tight wrapping, usually about 1m per wrap, and the stress on the cable, a loose tube design is generally used and extra fiber length is provided to prevent stress on the fibers. OPAC cables can be installed on most cables even under live conditions. They are designed to fit over tension splices. If aircraft marker balls, vibration dampers or other devices are installed on the cable, they need to be removed before OPAC installation. Some of these devices may be reinstalled after the OPAC installation. Special devices are required to prevent coronal discharge near towers and at drops for splicing because the high electric fields around high voltage transmission lines can cause coronal discharge that may damage the cables. All dielectric self-supporting (ADSS) cables are designed with more strength members and a thicker jacket to have adequate strength to withstand the tension and environmental stress of aerial installation. ADSS cables can be installed without messengers or being wrapped around other cables. These cables require special hardware designed to grip the cable on the jacket properly without causing damage to the cable over long term high tension loading. 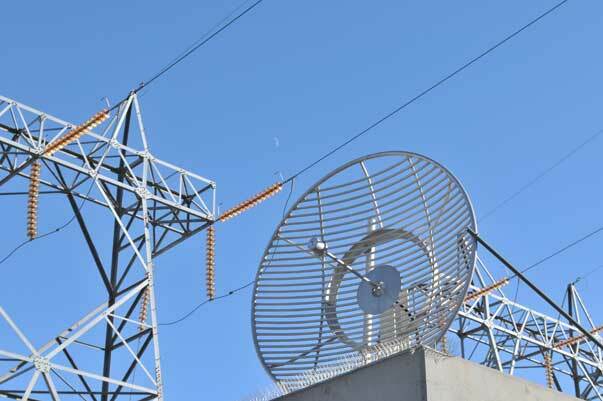 While their all dielectric construction allows installation near power lines, ADSS cables are generally installed on poles or towers below the power lines. 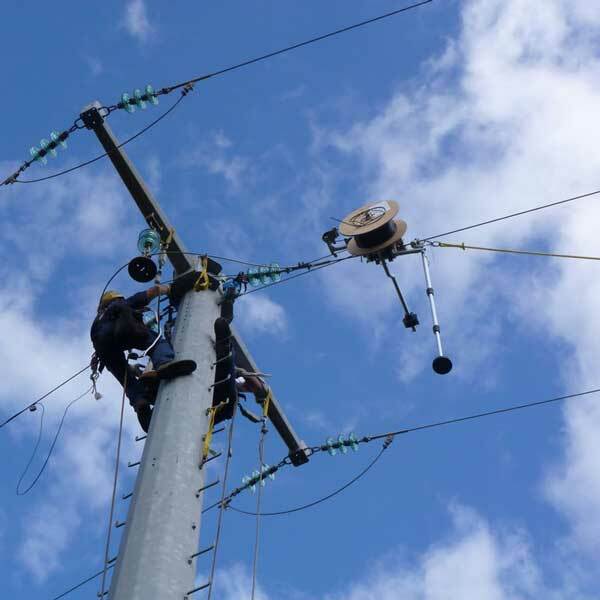 The location of ADSS cables on poles or towers is important because the high electric fields around high voltage transmission lines can cause coronal discharge that may damage the cables. ADSS cable manufacturers can provide guidance on whether ADSS cables are appropriate and if so, assistance on where to locate cables on towers and any special hardware that is required. 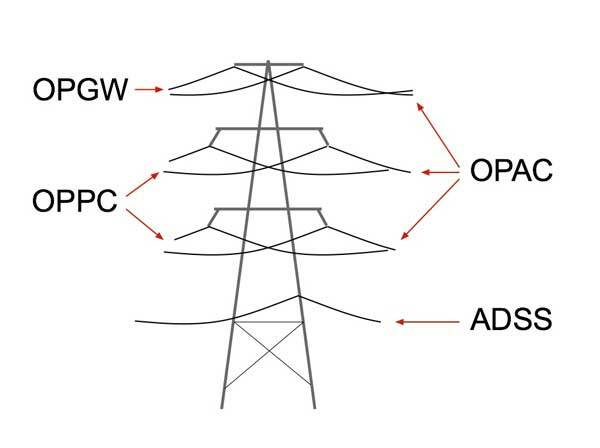 Like OPGW and OPPC, splices on ADSS installations are generally done on the ground and closures placed on the pole. If it is not possible to install aerial cables, cables may be placed underground. But if cables are underground near power line rights of way, care should be taken with any conductive cables (e.g. armored) or cable locator wires. 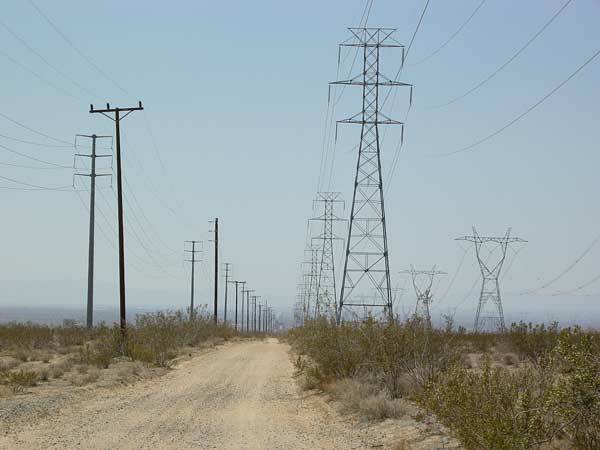 Failures of high voltage transmission lines can cause high ground currents near towers that can damage conductive cables or locators. This is another item that should be discussed with knowledgeable personnel. 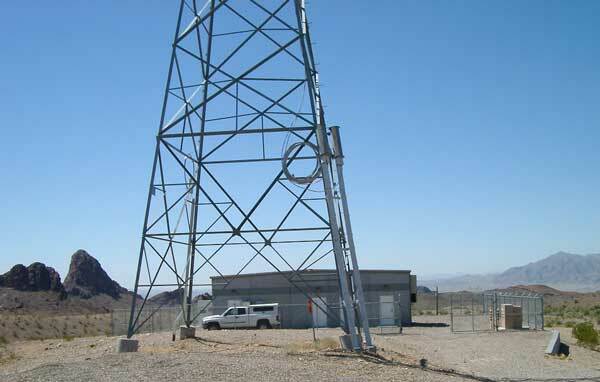 Communications huts are placed along the transmssion lines where signal regeneration is needed or communications route drops or branches are required. The design of a fiber optic network for an electrical utility requires a coordinated effort between knowledgeable designers and engineers from both fiber optics and electrical networks since so many unique factors are involved in these networks.